It’s week 2 of Nonfiction November and this week’s prompt is fiction and nonfiction book pairings. We’re looking for fiction and nonfiction titles that tie into each other. Hop over to Sarah’s Book Shelves to read everyone’s selections for this week! In my classic overthinking style, I originally had a bunch of book pairings and this post became ridiculously long. I’ve kept one but look for the rest of my matches to be posted next month! The theme that comes to mind first for me is existentialism. (How’s that for jumping into the deep end?) Honestly, I don’t read much (enough?) fiction. If I do, it has to be some sort of metaphor for a universal human truth for me to enjoy it. This is surprisingly hard to find in most fiction. I guess I’m just always looking for the adult versions of Meg Wallace, Encyclopedia Brown, and Peter, Susan, Edmund, and Lucy Pevensie. Nimona was a tearjerker for me. It’s the beautiful story of a young girl, who is not so young and not quite girlish, to learn to trust herself and become who she truly is. I’m not sure there is a more compelling storyline for me. The two main characters – Nimona and Lord Ballister Blackheart – hooked me from the first panes. I’m not giving away any spoilers in this post but if you want to know how in the world Nietzsche and a graphic novel ended up wound together, read this book. If I could hand fictional characters a book, I would have given Lord Blackheart a copy of Beyond Good and Evil by Friedrich Nietzsche at the end of the story to help me cope. He doesn’t have to agree with every point made (I don’t) but it’s a wonderful book to help you come to your own conclusions about what is good and what is evil in this world. And to Nimona – sweet, dear little Nimona, I’d want her to read Being and Time by Martin Heideggar. As she’s a bit young for this, I recommend A Simple Guide to Being and Time by Dr Steven Foulds. Personally, I think every teenager should read this book to help them dissect their thoughts and learn how to think through the bigger issues in life. Learning to cope with life means you don’t feel the need to escape from it 24/7. Being and Time won’t tell you how to be but it will help you determine who you want to become in your own time. That’s it for this week! Stay tuned for next week’s prompt! 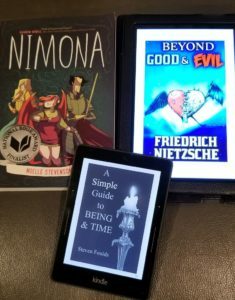 What book pairings would you recommend for me? Or what meaningful fiction have you read that you think I should read next?